There are no men in Claysoot. There are boys—but every one of them vanishes at midnight on his eighteenth birthday. The ground shakes, the wind howls, a blinding light descends…and he’s gone. They call it the Heist. Gray Weathersby’s eighteenth birthday is mere months away, and he’s prepared to meet his fate–until he finds a strange note from his mother and starts to question everything he’s been raised to accept: the Council leaders and their obvious secrets. The Heist itself. And what lies beyond the Wall that surrounds Claysoot–a structure that no one can cross and survive. Climbing the Wall is suicide, but what comes after the Heist could be worse. Should he sit back and wait to be taken–or risk everything on the hope of the other side? 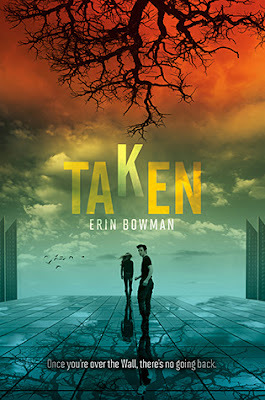 I featured Taken on a Waiting on Wednesday post when I stumbled across it and was intrigued by the synopsis. I really enjoy dystopian novels and was curious about the world Bowman had created. While not without flaws, as Bowman’s debut novel I was thoroughly entertained and slipped easily into the world she created. The tale begins in Claysoot, a primitive town enclosed by a wall. Anyone attempting to leave over the wall dies. There are no men in Claysoot because of what they call the “Heist”. At midnight on their eighteenth birthday the ground shakes, the wind howls and a blinding light appears and the boy is gone. Gray Weathersby has recently lost his brother to the heist and is left alone. He finds part of a letter addressed to his brother by their deceased mother and it makes him begin to question everything. The tale that unfolds was clever, reminiscent of the movie The Village and an intriguing start to a new trilogy. Most of the tale is told from Gray’s perspective and while I did not always connect with him I did admire his willingness to question, research and explore. He is loyal, hot-headed and too often makes decisions based on his feelings. At his core he has admirable traits but I am still looking for growth and further development. Emma is his love interest in Claysoot. She began as a strong character but quickly fizzled for me. I didn't completely feel their connection so when the dreaded love triangle was introduced I was happy for a change. *gasps* Bree is a strong, confident character and at times she overshadows the protagonist. I was immediately drawn to her as she tends to see the whole picture and is rational in her approach. Frank made me uncomfortable from the beginning; he was overly nice and way too talkative. We meet many characters along the way, some memorable and some quickly forgotten. From the beginning I questioned how boys were heisted, what lived beyond the walls and how Claysoot came to be. Bowman did a wonderful job of creating a believable world and her explanations made the tale feel genuine. I had some issues with the little details, not for the world itself, but in the characters reaction to it. For example, Gray lives in a world where there is no electricity and suddenly he is thrust into a world with cars, lights, and technology and he doesn't question it or fear it? The only thing he questioned was a gun. Bowman does explain how the original residents of Claysoot appeared and had memories of tools, farming etc but none of their families. This would have worked had Gray been an original but he was conceived in Claysoot leaving me flustered. Ironically, despite this I still found the world, factions and back-history fascinating. There were a lot of different threads, and some clever twists but I want to see things tightened up. Overall this was a solid start and I am hoping to see more development in the next book. Taken was a good start to an interesting dystopian and despite flaws I look forward to seeing both the author and series develop. I don't read YA dystopian often, but this sounds intriguing. I want to know more about The Heist! Yea, I would have had probs with the world as well. You would think he would freak a little. Still, it sounds entertaining enough and hopefully the questions in this book will be answered in the series. I usually hope for that. :) Brilly review! Great review Kimba, positives and negatives clearly spelt out. I do think I'll give it a shot someday thought as it's an interesting plotline. I do wish the characters sounded more engaging though.